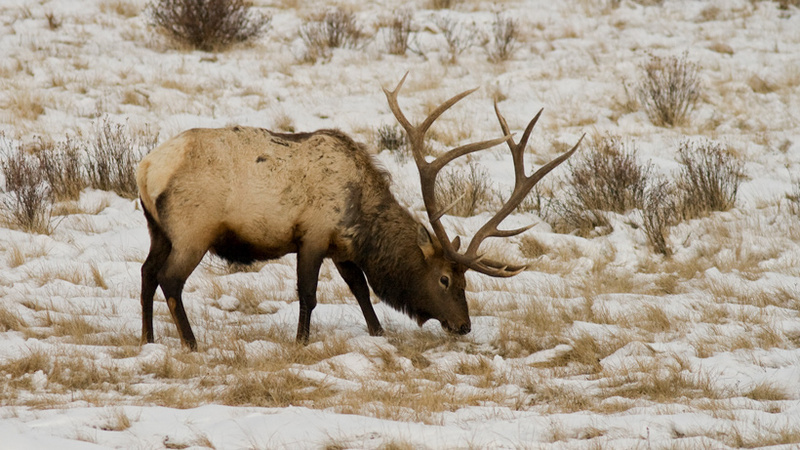 Montana Fish, Wildlife and Parks (MFWP) recently completed a survey of elk that live in the Tendoy and Bangtail mountains in Montana. The purpose of the survey? To determine whether the animals were infected with brucellosis, an infectious disease that impacts cattle, bison and elk, resulting in high mortality among calves. The survey is part of a multi-year brucellosis surveillance project and is a collaboration between the Montana Department of Livestock (MDL) and MFWP with additional support from the Rocky Mountain Elk Foundation. The good news? Out of the nearly 148 elk captured by MFWP crews, none tested positive for brucellosis, the Billings Gazette reports. Crews used helicopters to travel within the Tendoys and Bangtails. 99 cow elk were captured in Hunting Districts (HD) 302 and 328 in the Tendoys and 30 animals were collared with GPS collars to keep tabs on them for one year, according to the Billings Gazette. 49 cow elk were captured in HD 393; 15 animals were also outfitted with GPS collars to track their progress for a year. The surveys are used in order to establish boundaries for the MDL’s brucellosis designated surveillance area (DSA). MDL uses this DSA for livestock, which is “partially based on elk brucellosis testing results and movement data,” the Billings Gazette reports. Any ranchers that raise cattle or domestic bison within the DSA “are subject to additional testing and identification requirements” to keep Montana livestock herds safe from disease.